This is wooden giant chess piece which stand at beach hotel area. King chess may the perfect choice for decoration need. It is handmade chess piece with beautiful carving detail. King Chess is a beautiful ornament for your hotel. As seen in the picture, the King chess is placed at outdoor hotel area and give its special touch for the hotel. It becomes the point of interest of the space and unique idea to welcome the guests. King chess piece has made from Teak wood material which known as the strongest wood in the world. Based on its main material, the giant chess King is durable for outdoor use in any seasons. 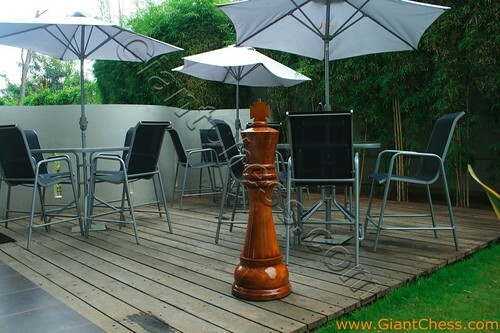 Durable and unique, the giant chess is really perfect for outdoor decoration, such as at patio area, garden area, backyard, hotel garden, public park, villa, camp ground, etc.